Daylight saving time—the practice of moving the clock forward one hour—has many critics. Losing an hour of sleep only to wake up to darkness? No thanks. But is Benjamin Franklin to blame for this “invention”? Daylight saving time is one thing that Franklin did not invent. He merely suggested Parisians change their sleep schedules to save money on candles and lamp oil. 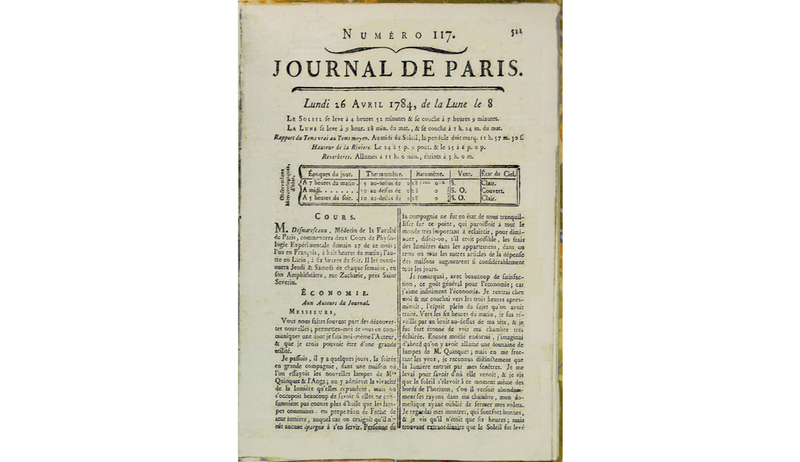 The common misconception comes from a satirical essay he wrote in the spring of 1784 that was published in the Journal de Paris. In the essay, titled “An Economical Project,” he writes of the thrifty benefits of daylight versus artificial light. He describes how—when woken by a loud noise at 6 a.m.—he noticed that the sun had already risen. First. Let a tax be laid of a louis [gold coin] per window, on every window that is provided with shutters to keep out the light of the sun. Second … Let guards be placed in the shops of the wax and tallow chandlers, and no family be permitted to be supplied with more than one pound of candles per week. Third. Let guards also be posted to stop all the coaches, etc. that would pass the streets after sunset, except those of physicians, surgeons, and midwives. Fourth. Every morning, as soon as the sun rises, let all the bells in every church be set ringing; and if that is not sufficient? Let cannon be fired in every street, to wake the sluggards effectually, and make them open their eyes to see their true interest. So who did first propose daylight saving time? We can place the blame on a New Zealand entomologist, George Hudson, who wanted more daylight in the evenings and presented the idea in 1895.